Improved the 17-03-02 oligarchy or autocracy; 17-02-24 UDHR; link; preamble; Military Staff Committe. This article was published the 17-02-23 on WWW.AMORISM.CC at 15:54 o'clock. Amorism® is a non-political philosophy. This article shows my privat ideas. 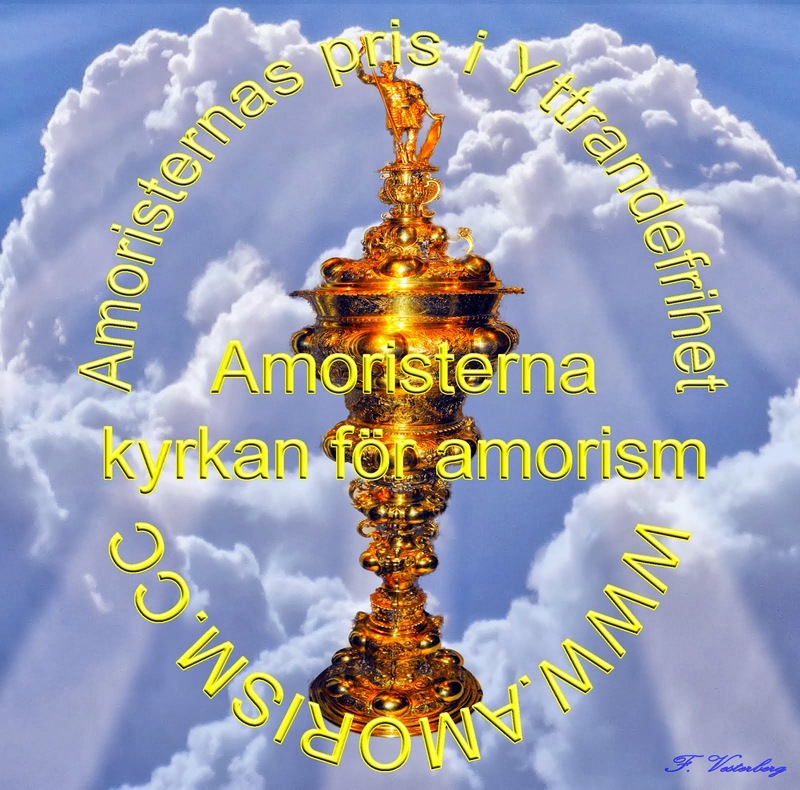 Amorsism is a non demanding (thus non-political) philosophy/religion. Because of the non demanding spirit of amorism noone has to agree with this article. Amorism is as non-political as any ideology could be. Amorism is primarily an ideology that educates about the meaning of words. 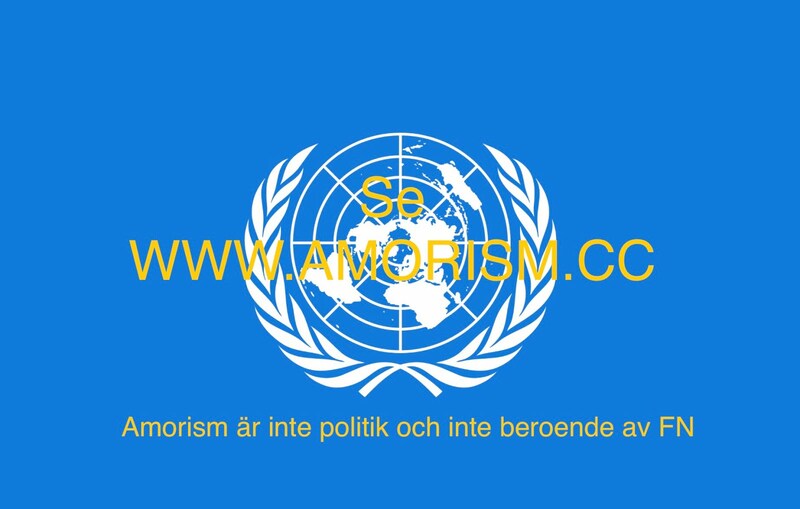 Amorism is not for anything, and not against anything, including the United Nations (UN). The only exception to this is that amorism demands that the leaders of amorism are to be decent persons and wholly hearted amorists. 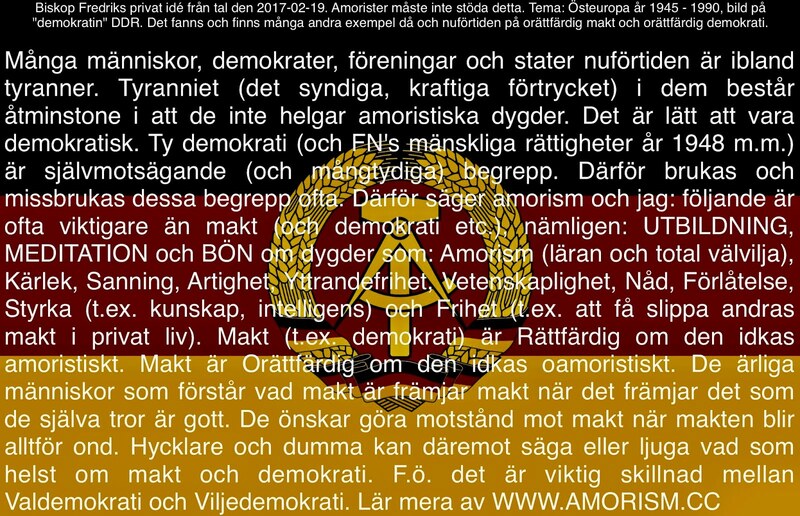 Amorism is administered by the organisation/Church Amoristerna; see correct name in image in the article; (since machine translators may translate incorrectly). The aim of this article is not to counteract the UN. But to inform about important facts about the UN which many humans don’t know. The article is written because many are naive of the UN and its Human Rights (UDHR). The UN is not a pacifist organisation. The UN is not a true democratic organisation. The problem is that many don't know what democracy really is. Therefore amorism is needed. Namely, the new paradigm and education for the world. 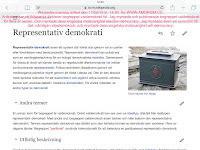 The UN or other organisations ought to amorist-certify groups and activities rather than naively work for "democracy" and UDHR (see link in this article). Amorism hallows approximately 15 virtues. Educate about amorism instead of just being too naive and illusory about democracy and human rights UDHR. The UN is an oligarchy or an autocracy. But it has democratic or "democratic" branches. (I the author Fredrik use a "tree-parable" for the UN.) Definition: If at least one person in a group has veto, then there is at least partial autocracy. Autocracy is the opposite of what I call election-democracy. The book Amorism explains that a person means a physical person (human) or a juridical person. A juridical person can be for instace: a goverment by for instance a king, a democracy or a "democracy". The fully or partial autocratic feature of the UN is because each permanent member of the Security Council has veto, which menas the right to ignore democratic decisions or other persons decisions in ones own group. The ones who have veto own half or full autocracy. Oligarchy means ruling by a minority, a few humans, over a majority. An oligarch is a leader who is a member of an oligarchy. Oligarchy is not democracy. Democracy is the ruling by a majority (of humans). But the difference between democracy and oligarchy may be vague. 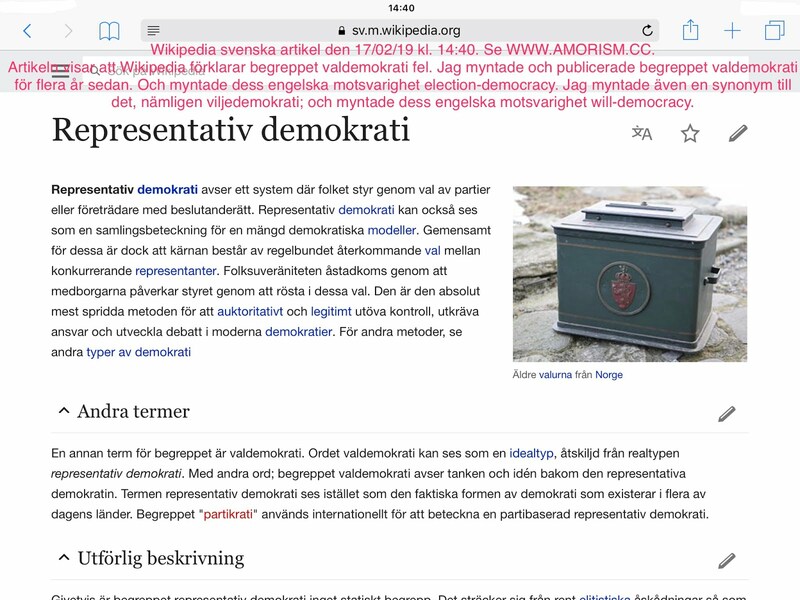 Many persons, associations, organisations and states claim to be democratic. But often they are only oligarchies or something else. Therefore the concept pseudo democracy is important; it means untrue democracy. United Nations (UN) was founded in the year 1945. The Security Council (UNSC) is the stem of the UN tree. The UNSC consists originally of the five victors of World War II, namely: the United States, the United Kingdom, Russia (originally the Soviet Union), the French Republic and the People's Republic of China (originally the Republic of China); these are the main members of the UNSC. The so called "five permanent members" or the "root of the UN tree". I also call these five for the "oligarchs". The oligarchs can veto (i.e. stop) any Security Council resolution. The oligarchs suggest or stops states from becoming members of the United Nations. The oligarchs suggest or stops candidates for Secretary-General of the General Assembly (GA), which is a "democratic" "branch of the UN tree"; but only a branch, not the stem. The General Assembly elects the 10 non-permanent members to the UNSC. (But only GA members who pay enough to the UN are allowed to vote in the GA.) Note, the non-permanent are members for only two-years. So the UNSC (the the "stem" of the UN) consists of fifteen members, as mentioned: 5 permanent oligarchs + 10 "democratically" elected non-permanent members. The stem’s president (or chairmanship) is changed automatically every month; in alphabetical order of the member states. But as mentioned, the UNSC and its presidents are subordinated in some way or another under the oligarchs and their veto. The oligarchs do not have to obey the UNSC. Each permantent member has veto and can stop any election in the UNSC by voting no in the election. But the other members of the UN have to obey the UNSC. UNSC is not for total peace. The oligarchs are allowed to conduct wars by themselves or via two branches of the UNSC. 1. The advisory, intelligence and diplomatic branch is the United Nations Military Staff Committe (MSC). The UNSC's militant branch has troops and weapons (provided by the UN member states), namely the United Nations Peacekeeping (UNPK). Also this branch is subordinated under the oligarchs. The UN has other branches for politics and education. But they are not mentioned in his article. An image here shows article no. 30 of the United Nations (UN) human rights (UDHR). Article 30 reveals the extremist-fundamentalist spirit of the UDHR. Honestly, it ought to be read first, namely as number 1 instead as of number 30 articles; not as the last. By the way, fundamentalism is very usual in so called democracies, pseudo democracies. The UN was originally a military alliance. Amorism does not have any obligation for it's members. Since amorism is non demeaning and a non extremist, universal, very important philosophy for the whole world. Hopefully more humans see this. Please, support amorism. Then the world probably will be better. A) Short explanation of the concept total benevolence. Link: Total benevolence. B) Explanation of benevolence. Link: Benevolence. C) Defintion of the concept amorism®. Link: Amorism. 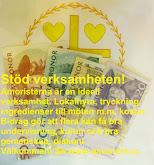 D) Article in Swedish about amorist-certificarion amoristcertifiering. Many concepts are too "wide" and therefore abused. Democracy is too often abused. Therefore amorism is created. Because there are more important concepts than for instance democracy. Namely at least five of the approximately 15 amoristic virtues. 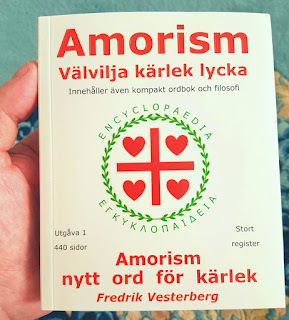 Link: Amoristcertifikat.